The Nike Air Force 1 Duckboot is back for winter 2014! Last year the winterized Air force silhouette got some very nice looks. Pricing was eh, but the boot really was a boot. For those that live in the colder climates, Nike has you covered this winter. A few new colorways are coming, including the two pictured here. The Black/White/Metallic Silver/GM Light Brown colorway below is gorgeous and definitely something I plan on wearing in the snow. The black toebox is coated in a synthetic material, while the rest of the upper is lathered in brown leather. The Umber/Velvet Brown/Sail/Team Red colorway above features a synthetic toebox and leather upper with the addition of some brown suede. 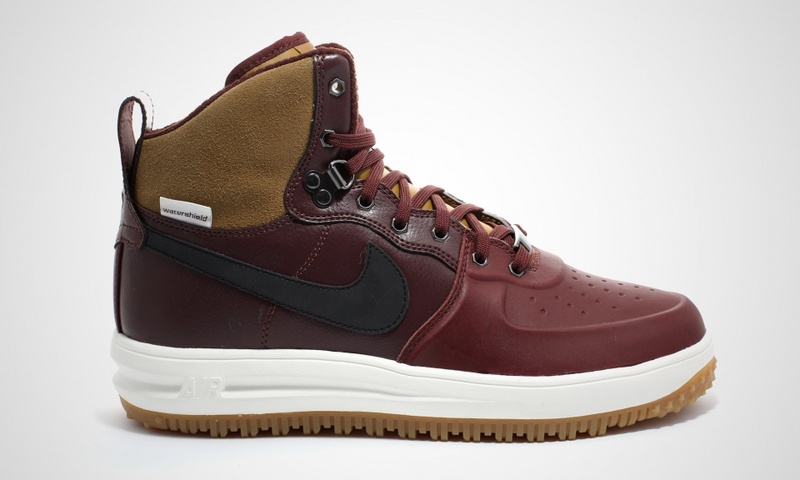 It also looks like this colorway sits on a Lunar outsole, a nice addition to the Duckboot line. No word on a release date but these Duckboots will be available soon at 43einhalb as well as other European retailers. Retail looks to be set at $160. Are you feeling these upcoming Nike Air Force 1 Duckboot colorways? Let us know in the comments below.